By carewoman from orlando fl. Prevail® Adult Disposable Washcloth - Jumbo Soft Pack Press-N-Pull Lid - 12" x 8"
PDI Hygea Premium Multi-Purpose Adult Washcloths - 11.5 x 9"
Hygea Premium Personal Washcloths by PDI are large 9.5 x 11.5 in. disposable washcloth for quick large area cleaning. One hand dispensing permits continuous contact between caregiver and resident. Gentle cleansing formula is suitable for all areas of the body, including face. Pleasant fragrance. 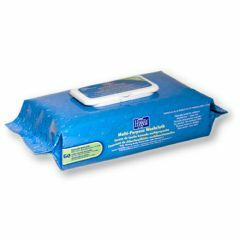 There are 60 pre-moistened wipes per pack, and 6 packs per case, or 360 wipes per case. The more you buy, the more you save! Travel. bed-bound. Home. spot cleaning. Caregiver. For wife of 52 years.. Comfortable. Smells good. Wipes are large. Wipes are great for those times when you cannot are unable to take a shower or bath. The wipes are a large size, dispense fairly easy, and I like the fragrance. Large enough for the job. Comfortable. Can they be flushed down the toilet? How thick are these? Are they almost the thickness of a facecloth or thin like a papertowel? These are thin like wipes. The word "washcloths" is confusing. These are thinner than a viva paper towel. Are these heatable in the microwave? Yes, but I would not recommend doing so, as an overheated washcloth can cause a severe burn, being that many microwaves don't lend themselves to precise control, and all heat unevenly. Nowhere on the package does it say that you can heat this in the microwave, and unless it says you can, I would not do so.